The engine in this Power Wagon is a 251 cu. in. flat head six cylinder. Since the engine had only 30,000 original miles, and 130 lbs. of compression across all cylinders, I decided not to rebuild. The engine was washed down, and all the oil and dirt was removed. I removed as much off the engine like the distributor, oil filter cannister, oil filler, starter, fan, air filter, alternator etc. as possible. Then the engine was degreased, primed and painted Chrysler Red. All of the parts from the engine were also primed and painted. Then the engine was put back onto the frame. Finding a new front motor mount for the 251 cu. in. six was no easy task. After a long search at every Power Wagon parts house, and motor mount dealer and manufacturer, without any success, I ended up using a Chrysler motor mount that would bolt in fine after drilling a couple holes, and was the same thickness as the original. 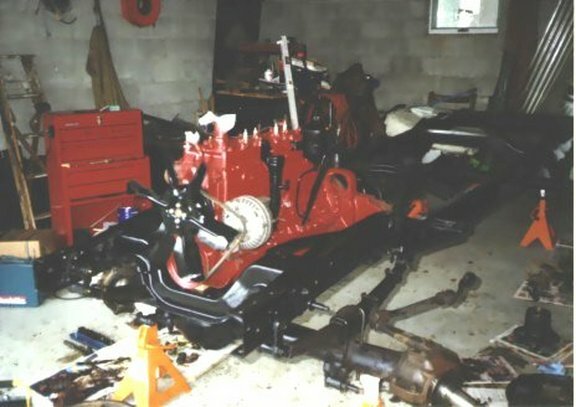 Picture of engine in frame.